Higher high: When the high today is higher than the high yesterday or higher than the high of the past few days, you have a higher high. Higher highs refer to visible peaks, not a higher high every single day. A series of higher highs often signals that the market is feeling enthusiastic about the security. Higher low: You need to qualify the higher high as truly indicating that a trend may be forming. What you want is an additional confirming condition — you can specify that you must also have higher lows. Now you have two pieces of evidence that bulls outnumber bears. A series of higher highs together with higher lows hint that a trend is forming. After two days, you aren’t yet sure what is happening, but you’re starting to get excited. Your key assumption is that a trend, once formed, will continue. Traders already in the security are taking an early profit. The market is reconsidering whether the new high is really justified. The higher highs were just a random accident. You seldom see an unbroken series of higher highs on every single day. This figure shows a series of days on which the close is higher than the close the day before. At the same time, the price is making a fresh high nearly every day, but not every day without fail. 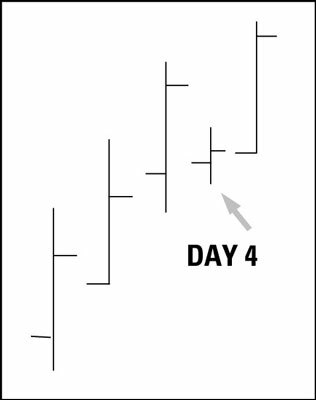 On Day 4, for example, the close was higher than the open and the low was higher than the day before, but the high of the day was not higher than the day before. Most analysts tell you not to worry about this particular configuration of bars. It’s an uptrend, all right, and you know this because you have an unbroken series of higher lows. Day 4 is a disappointment — it doesn’t deliver a higher high — but the low is higher than all the previous lows. By considering the additional factor of higher lows, you confirm that the probability is pretty good of getting a higher high and a higher close on Day 5.